Long-held to be associated with the Pagan Autumn Festival or Harvest Home, Halloween is a holiday on which superstition and role-playing cooperate for the purpose of acquiring confections from charitable neighbors. Obviously, the previous statement is an exaggeration of a holiday where people dress-up, knock on doors while asking for candy, or (in the case of adults) an opportunity to go out and drink with friends and strangers. But have you ever considered what candy complements that beer in your hand? So what's a food pairing? It's no secret that people love a good beverage when munching on microwave hot pockets, oven-baked frozen pizza or a stovetop-cooked bowl of mac'n'cheese. The tradition matures when eating out, whether it's at a football game consuming a beef hot dog, or while sitting down with an expensive-cut of steak. Often times the assumption is, especially with elevated meals (e.g. steak, pasta, or seafood) that a glass of wine beats a pint of beer or cider hands-down. But prevailing stereotypes are slowly being deformed, adapting to the plethora of styles beer ferments into. Recognizing this, both casual imbibers and brewers have written guides to pairing beer with food. Without getting lost in the weeds, let's just say that a $65 cut of Wagyu Beef can be paired with either an Amber Ale or Belgian (e.g. Triple, Dubbel, Quadrupel), while an India Pale Ale works well with fermented vegetables (e.g. Kimchi or Sauerkraut). And before you pose the question we can confirm a barleywine will pair nicely with a plate of chocolate or a slice of chocolate cake. Mind you these are only loose suggestions and may fail to address the nuances of your individual recipes. 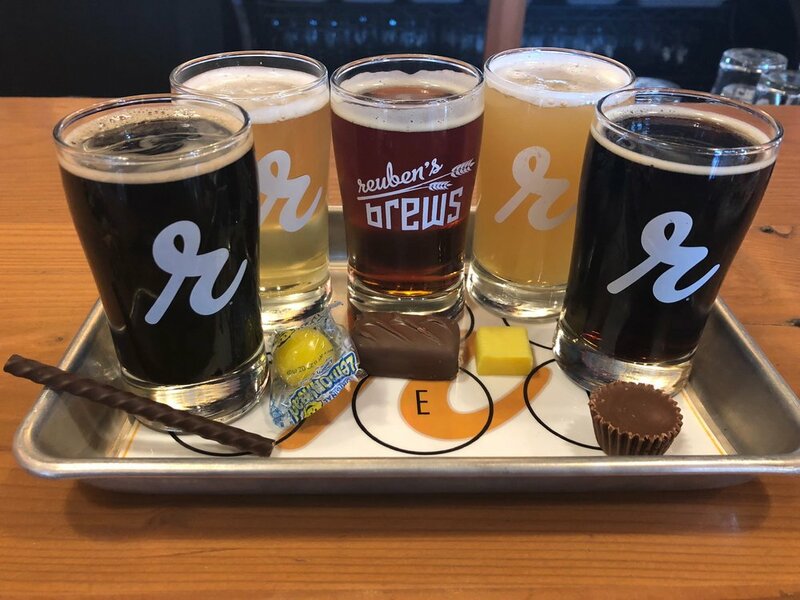 There is something traditional about complementing the beautifully-marbled steak or dessert with the proper beer, but have you considered what beer goes with Halloween candy? Inspired by a brewery's courage to speak up, we contacted some breweries in the Pacific Northwest and asked them to suggest some food pairings with everyone's favorite Halloween confections. Apparently, the question has few answers. So allow us to contribute to the conversation with a few suggestions. Crux Fermentation Project's Gimme Mo. Pike Organic Double Oatmeal Stout. Mounds. "Mounds are coconut candy bars covered in dark chocolate." Black Raven Coco Jones Coconut Porter. Thanks to all the breweries contacted that took time to share their suggestions on enjoying some halloween confection with pint (or two). Northwest Beer Guide: Thanksgiving Pairing: 2017: Don't forget those sides! Northwest Beer Guide: Thanksgiving Pairing: 2017: Beer with (or on) the bird. Ray's Cafe announces the breweries, for their 3rd annual Ballard Beer Awards. Pelican Brewing presents a rare opportunity to enjoy many of their barrel-aged beers, with "Take Flight". November 11th and 12th. With the departure of Jim Kelter, Full Sail Brewing promotes it first head brewer in 27 years. Introducing head brewer Greg Doss.